Mounds of herbs, spices and dried flowers. Different people come to Dubai for different reasons; some for the tallest building, some for the gold and some for its unabashed opulence. What most of us conveniently ignore and underestimate is Dubai’s spice market — the ultimate paradise for a food connoisseur. 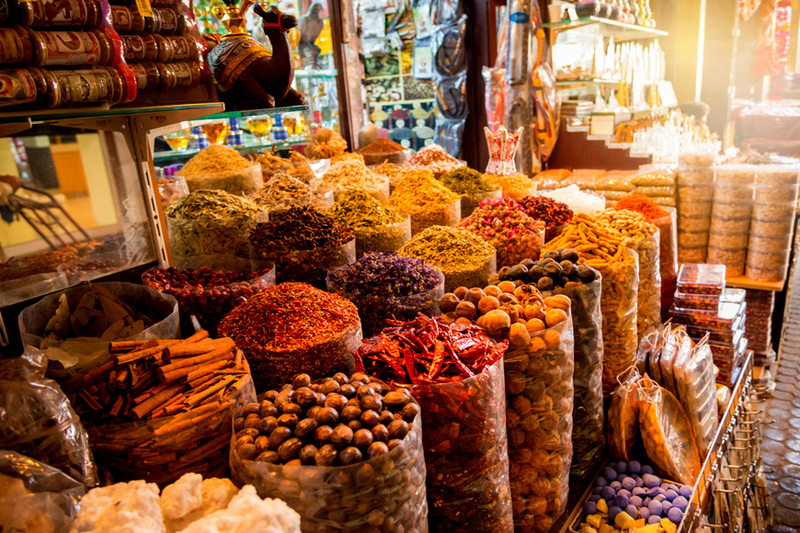 Dubai Spice Souk is a true calling for those who are blessed with the knack to identify deliciousness before its cooked. Located in Deira, just a few blocks away from the famous Gold Souk, the narrow alleys of the Dubai Spice Souk brim with vibrant mounds of herbs, spices and dried flowers. Almost 50 years old, the market offers every kind of spice and herb imaginable. Once you get past the crowded corners and strong aromas, you’ll be greeted with rows of small stores — spice-filled with photogenic burlaps and sacks for visitors to see, touch, smell and buy. From fairly common items like chillies, turmeric and pepper to exotic sunflower extracts, mace and nutmeg — it’s all there for the taking. There are bags full of incense, rose petals, rare chocolates and traditional medicinal products stacked outside each stall. Middle Eastern and Arabic spices such as cumin, cardamom, tahini, za'atar get special attention due to their popularity among the locals. But that doesn’t mean there’s a lack of international cuisines. Biryani flavours, BBQ mix, dried and crushed berries, Moroccan spice mix, marinade powders — it’s a food haven. If you're interested in buying then roll-up your sleeves because bargaining is the norm here, particularly when paying cash, which is the most common way to pay.